President Donald Trump embarks on his first overseas trip since taking office just as a special counsel picks up the investigation into his campaign’s ties to Russia. Follow the events and itinerary over the next week as Trump meets with world government and religious leaders. Political watchers are holding their breath to see if the discipline Trump displayed during his overseas trip made it back to the U.S. The president was joined by first lady Melania Trump in a pre-Memorial Day visit to Naval Air Station Sigonella outside of Sicily. President Trump on Saturday refused to endorse a global climate change accord during the summit with international leaders, saying he needed more time. The president was finally expected to promise that America would defend its NATO allies if they ever came under attack. He didn't. 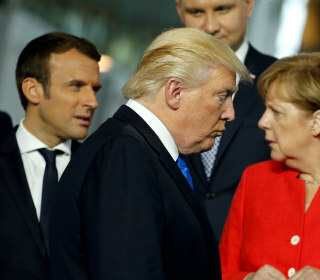 World leaders braced for contentious talks Friday with President Donald Trump at the G-7 summit after he earlier lambasted allies at NATO. Balkan websites ran headlines such as "America First" and "Where do you think you are going?" but Montenegro's prime minister wasn't too upset. World leaders appeared surprised as the president said 23 of the 28 member states owed “massive amounts of money” to U. S. tax payers. "Brussels is a complex city and European society is different from American society and he doesn’t seem to get it," one resident told NBC News. President Trump concluded a two-day visit to Italy that included a meeting with Pope Francis before heading to Brussels for a NATO summit. President Trump met Pope Francis at the Vatican on Wednesday — the latest in a string of high-level meetings at sacred religious sites. The diplomat in the front seat turned around: Once we get past the guards, he warned, take off any credentials showing the Israeli flag. President Trump visited the Western Wall and Yad Vashem during a visit to Israel and the West Bank. President Donald Trump placed a note in the Western Wall in Jerusalem on Monday, becoming the first sitting U.S. president to visit one of Judaism's holiest sites. I discovered the joys of a fifteen-minute falafel tonight. We’re in Jerusalem on Day 4 of President Trump's first trip abroad. "We can truly achieve a more peaceful future for this region and for people of all faiths and all beliefs," the president said on Monday. The ongoing Israeli-Palestinian settlement debate could complicate President Trump's quest to negotiate "the ultimate deal": a peace accord. 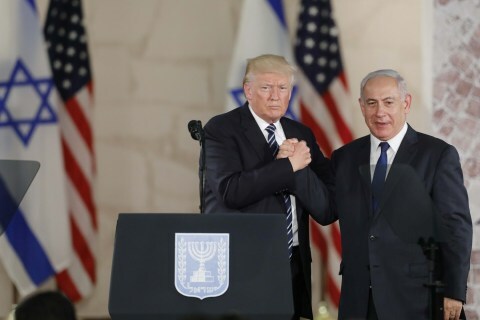 JERUSALEM — President Donald Trump and Israeli Prime Minister Benjamin Netanyahu appeared together Monday and vowed to make a renewed effort at peace. JERUSALEM — President Donald Trump said Monday he never mentioned the word "Israel" as the source of intelligence about ISIS during a meeting with the Russian Foreign Minister, while Israeli Prime Minister Benjamin Netanyahu insisted that "intelligence cooperation is terrific" with the United States. A huge security operation aims to envelop the president and his 1,000-person entourage during his visit to Jerusalem and Bethlehem. 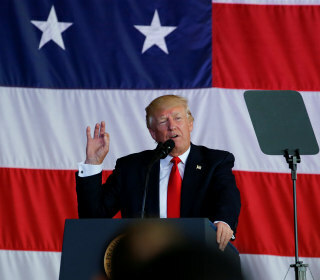 President Donald Trump tempered his rhetoric on the Muslim world in a speech given in Saudi Arabia on Sunday, earning praise from some corners and condemnation from others. President Donald Trump offered a message of unity in Saudi Arabia as he called on the Muslim world to confront extremism. In a Riyadh market, Saudis seem optimistic about President Trump's trip — and, back at our hotel, so do his senior advisers. President Donald Trump’s two-day visit to Israel, which begins Monday morning, should have been the easiest stop in his first overseas trip. The pomp and pageantry included a signing ceremony for a military arms deal to Saudi Arabia, and ended with music and dancing at a banquet. I want to thank King Salman for his extraordinary words, and the magnificent Kingdom of Saudi Arabia for hosting today’s summit. "One of the things that we will discuss is the purchase of lots of beautiful military equipment," the president said ahead of a meeting with Qatar. Melania and Ivanka Trump did abide by the norm of dressing in long sleeves and long pants expected in the culturally conservative kingdom. King Salman greeted Donald Trump as he arrived in Saudi Arabia, a longtime U.S. ally, the birthplace of Islam and an important regional power. The deal includes another $350 billion over the next 10 years, plus a 'letter of intent' to assemble 150 Lockheed Martin Blackhawk helicopters. President Trump kicks off his first overseas trip by visiting longtime U.S. ally, Saudi Arabia, Islam's birthplace and a conservative regional power.